Officer, STLS Posts. 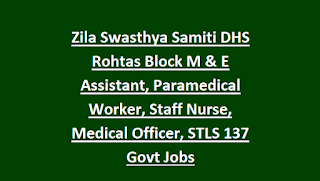 There are total 137 posts in this Zila Swasthya Samiti DHS Rohtas District Recruitment 2018. Candidates who are interested and having eligible qualifications for the said posts they can submit their application form to Rohtas District Health Society. Last date to reach the filled application form along with all the necessary documents for this NHM DHS Rohtas District Paramedical Worker, Staff Nurse (Grade A Nurse),Block Assistant, Medical Officer Jobs is 11-08-2018. Selection for this DHS Rohtas district Grade A Nurse, Medical Officer and other posts is through merit in qualifications. 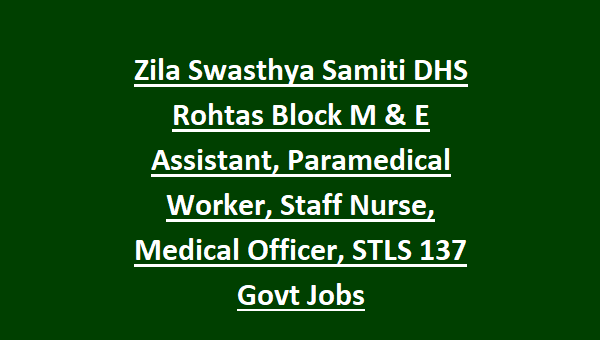 More details about these DHS District Health Society (Zila Swasthya Samiti) vacancies of Rohtas District post wise qualifications, age limits, salary, selection process, important dates, DHS application form details are given below. Last date to reach the application to NHM Zila Swasthya Samiti DHS Rohtas is 11-08-2018 by 05:00 PM. There are total 137 posts in this Recruitment of NHM DHS Rohtas District under NHM Bihar. For Block M & E Assistant jobs-Degree with 1 year computer knowledge certificate and typing skills of 40 WPM in English and 30 WPM in Hindi. Initially candidates will be short listed based on educational qualifications and previous work experience. Those short listed candidates only called for written test or screening test for this Zila Swasthya Samiti DHS Rohtas Recruitment 2018. Candidates who are interested in this NHM Zila Swasthya Samiti DHS Rohtas recruitment they can submit application in a prescribed format to Member with Civil Surgeon, Secretary, District Health Society, Rohtas (Near Sadar Hospital, Sasaram) on or before 11-08-2018. Must have attached Rs.25/- postal stamp having self address cover letter with application form. There vacancies are 11 months contract basis.